Sorry … but we’re postponing tonight’s Movie Night until next Tuesday February 5th, same time, same location — and still with fresh popcorn! Smile-inducing, jaw-dropping nature films that will make you want to get out and explore nature! Tuesday February 5th, 2019, 7:30 P.M., at the Orangeville Seniors Centre, 26 Bythia St. This entry was posted in meeting on 2019 January 14 by Mark Whitcombe. Outdoor adventurer Cylita “Batwoman” Guy of the University of Toronto and Ontario Science Centre will talk about her research on viruses and bats. November 27, 7:30 pm – 9:00 pm, at our usual meeting place. Cylita Guy is a PhD Candidate in the Department of Ecology and Evolutionary Biology at the University of Toronto. Her research focuses on bats and their viruses. 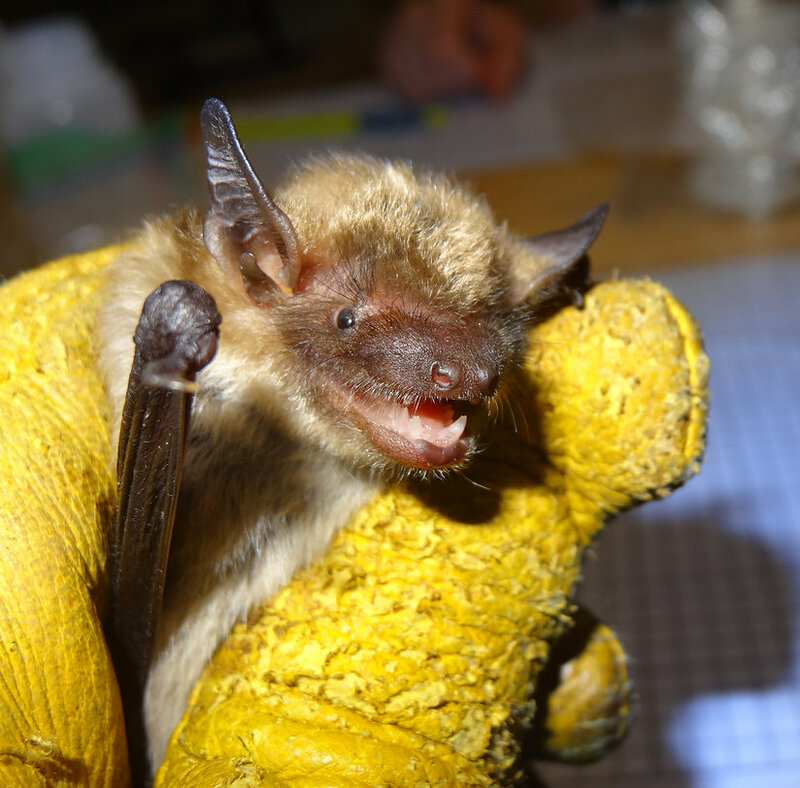 Using a combination of field and computational approaches she is investigating why bats seem to be good at carrying viruses that they sometimes share with humans, but rarely get sick from themselves. In her spare time she looks to help others foster their own senses of curiosity and discovery. She works as a Host at the Ontario Science Centre and started a Junior Bat Biologist Program in conjunction with the High Park Nature Centre. You can also read about her hilarious field exploits in the recent general audience book Fieldwork Fail: The Messy Side of Science! In her down time, you’ll find her chasing her next big outdoor adventure. This entry was posted in club, mammal, meeting, speaker on 2018 November 23 by Mark Whitcombe. For our final Speakers Night of the season we will be hosting a very unique hands on workshop. You will get to build and use a FoldScope, a functioning origami microscope made from paper. These were developed by Manu Prakash and his associates with intent of making microscopy available to everyone around the world. Here is Prakesh at a TED Talk describing his microscope and how it can revolutionize health care in developing countries. https://www.ted.com/talks/manu_prakash_a_50_cent_microscope_that_folds_like_origami . FoldScopes have become very popular with professional and amateur scientists and naturalists around the world for exploring the microbiome. The microbiome is a diverse world populated by creatures smaller than the eye can see. You will be using your FoldScope to look for creatures such as rotifers, nematodes, copepods, vorticella, tardigrades, and other fascinating creatures. Tuesday April 24th at 7:30 P.M. at the Orangeville and District Seniors Centre on 26 Bythia St.
Ready to fold the clever ramp (on the right side) used as a focusing mechanism. The left side is the lens stage. The finished FoldScope, ready for use! This entry was posted in club, meeting, speaker on 2018 April 17 by Mark Whitcombe. On Tuesday evening January 23rd, 2018, at 7:30 P.M., selections from the world-famous Jackson Hole Wildlife Film Festival are coming to our backyard! Join us for a special WILD On Tour screening of short films. We are highlighting the joyous and informative exploration of nature. Ron has chosen a variety of shorter films instead of 1–3 long films. 8. Return of the Cicadas. – 7 min. This entry was posted in club, meeting, speaker on 2018 January 6 by Mark Whitcombe. On Saturday December 30th, we completed our annual Christmas Bird Count. Approximately three-quarters of the total number of individual birds came from 7 out of the 38 species, mostly from those species that congregate in large flocks in winter often taking advantage of agricultural leftovers, i.e., American Crows, European Starlings, Wild Turkeys. On the other end, 7 species were represented by only 1 individual bird. In Area 2, south-east from Caledon, we certainly noticed that over a third of birdfeeders maintained and filled in previous years were inactive. That certainly reduced the number and the diversity of species we saw both in residential areas, and along the rural roads near houses. Up Trend: Highest number of Red-bellied Woodpeckers (20) versus 12 last year which was then the highest count. Red-bellied Woodpeckers were first seen in 2006 (1 bird) and then not seen again until 2010 (2 birds). Down Trend: House Sparrows at 16. Average the last five years is 30. Average for the first five counts (1987-91) was 441. Not a trend, but, rather surprisingly, we saw record numbers of Juncos, Snow Buntings and Grackles (2). On the Snow Buntings, a large flock was seen in both Areas 4 and 6, which adjoin on Hwy 9. I wonder if it was the same flock (estimated at 340 and 400 birds). “The unrelenting cold weather that has descended upon even the most southerly reaches of the province has limited the number of lingering bird species being discovered, and as a result the Ontario winter bird list is lower than it has been by this date in previous winters. “Since my last update on December 14, eight new species have been added to the list, bringing it up to 192. In comparison, last year by this date the winter bird list was 207 species, finishing at 216 species. The new additions since my last update are: Vesper Sparrow (Ottawa, London, Sandbanks), Brewer’s Blackbird (Long Point), Tufted Duck (Mississauga to Toronto), Eastern Meadowlark (multiple locations), Indigo Bunting (Seeley’s Bay), Lincoln’s Sparrow (Toronto), Ovenbird (Toronto) and Rose-breasted Grosbeak (Brantford). All in all, an excellent experience again this year! Important data was gathered and submitted to the Audubon Society. Citizen Science is important! We had good times together. We welcomed new and accomplished members, and welcomed back some great friends whom we’ve not seen much of. I’m sorry to have missed the wonderful potluck and post-count gathering hosted by Kevin and Carol. Thanks to Ron Jasiuk and Russ Macgillivray for organizing this important UCFNC annual event! (If you wish more complete information, please Contact us! This entry was posted in bird, Christmas Bird Count, club, field trip on 2018 January 3 by Mark Whitcombe. Christmas Bird Count 2017: Get your binos and warm clothes ready! Our annual Christmas Bird Count will be on Saturday December 30th, 2017! Ron Jasiuk and Russ McGillivary are organizing this year’s event. We have sent out details and invitations earlier, so if you’ve missed them, contact us. Across North America naturalists have been participating in Christmas Bird Counts for well over 100 years. One of the first participants was a Toronto birder! The first UCFN Christmas Bird Count was conducted on 12 Dec 1987. So this is the 30th anniversary. The data gathered by volunteers is used to track changes in populations and ranges of bird species. It’s also a great opportunity to enjoy and become familiar with winter birds. Our bird count area includes Alton, Erin, Inglewood, Orangeville, Mono Mills, and the surrounding areas. The bird count area is divided into six sub-areas each of which is covered by a team. Last year, because of our cold weeks earlier in December there was no open water other than in streams and creeks so that waterfowl were all but absent in late 2016. However, this Christmas Bird Could is not about bigger or better numbers — it’s about getting as detailed an inventory each year to build into larger patterns. Let’s see how the numbers from this year turn out! Participants work as a group with an experienced leader. Most searching for birds is conducted by scanning skies, fields and yards by driving along backroads and residential roads. In some areas short sections are covered by foot. Participants spend the count day monitoring their feeders, listing species and the greatest number they see at any one time. If your property is outside the count circle your information cannot be included in what we send to Bird Studies Canada, but the club will be interested in what you saw and your sightings will be included in the next club newsletter. Contact us for the form we’re suggesting for gathering data. Traditionally, count day ends with a pot luck supper for all members regardless whether they were counting or not. It’s a great time to socialize with fellow club members and to share stories about the days’ sightings and adventures. This year we will be gathering December 30th starting between 4:30 and 5:00 P.M. For details, contact us. If you are interested in participating in the 2016 UCFN CBC do one of the following. area where your bird feeders are located and via email contact the leader of that particular area to let them know how you would like to help. 2. If you don’t have a preference where you would like to be birding, contact us. This entry was posted in bird, Christmas Bird Count, field trip on 2017 December 8 by Mark Whitcombe. January Nature Movie Festival is changed to January 23rd, 7:30 P.M.
We are taking advantage of a new opportunity for our January meeting: a nature film festival. Check this out jhfestival.org and click on the Festival Films on Tour. We are using mainly short films from Jackson Hole Wild to host an event at the Seniors centre for our members. We’ll provide more details shortly! Because of renovations at the Seniors’ Centre during the last week of January, we have to move the date away from January 30th to Tuesday, January 23rd at our usual time of 7:30 P.M. This entry was posted in Uncategorized on 2017 December 8 by Mark Whitcombe. Members’ Night, Tuesday October 24th, 7:30 P.M.
A couple of short informal presentations. A slide show of UFCNC member’s photographs. Displays of nature art, specimen collections, handiwork such as bird feeders. Lots of time for socializing and connecting with each other. Is there something interesting that you would like to share? How about giving a 5 – 8 minute presentation related to natural history. Do you take photographs? Send us 10–20 of your favourite nature photos of plants, animals, rocks, landscapes, whatever that you have taken in the past year and we will merge them into a slide show. Have you got something to display … a collection of bones, plants, a nature project that you’re working on such as a bluebird trail nest boxes, insect hotels or a native plant garden? We’ll reserve a table for you to display your stuff. Are you creative and have artwork such as paintings, sculptures, carvings that you would like to display. Let us know and there will be a table for you. Can you contribute of baked goods/snack items? Finger foods only please so we can avoid creating dirty dishes. Contact us by replying at the top of this post by Saturday Oct. 21st and let us know what you would like to present or bring to the UCFN Member’s Night. If you are contributing food also let us know, please. This entry was posted in club, meeting, speaker on 2017 October 20 by Mark Whitcombe.